Kids, especially girls, are drawn to horses. Little ones love a pony ride. Got any ideas for a picture book with a pony in it? 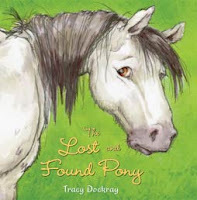 The book is The Lost and Found Pony by Tracy Dockray. No pony book ideas at the moment....but my theory is that kids are either riders or climbers. And you are right about girls and the pony thing! I wonder why that is? Yes! I was a rider. My horse was called Jiminy. He was great. I still think horses are almost magically wonderful animals.